Skincare is something that I am so big on. I obsess over it because I really do think its a huge part of your beauty routine. When I first moved to Utah my skin totally changed. Which actually makes sense if you think about it because I moved from Houston, somewhere so humid, to Provo, somewhere so dry! Well that summer after my freshman year I talked with my step mom and we agreed that my skin had gotten pretty bad, I had more acne then ever. It wasn't bad nor was it super serious but it was something that I definitely noticed and wanted to make better if I could. That fall I met with a dermatologist and at first he just started me antibiotics and then that didn't work so he put me on accutane! It was the worst six months ever! It was miserable, but it did help my skin,and since then its been clear. So since I have been off of it, I pay such close attention to what I'm doing to my skin and what I'm putting on it. I used to not care if I didn't wash my face before bed but now I can't fall asleep unless I wash it! I am so big on washing your face, not just for my personal reason but there is so many benefits from it and its only going to help your skin, and make it beautiful. 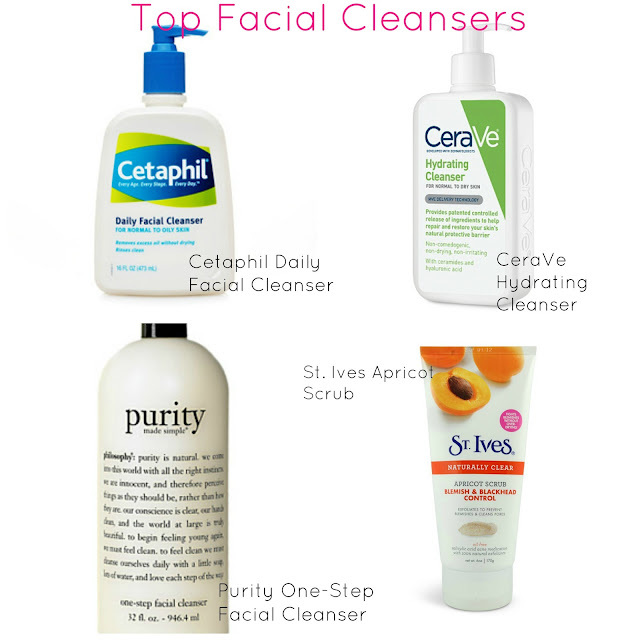 I have tried out several facial cleansers and these are my top four! My all time favorite has to be the Cetaphil Daily Facial Cleanser, this stuff is great! It really is good for all skin types, it doesn't dry you out too much, it helps with clearing up your skin for sure! My second favorite is the CeraVe Hydrating Cleanser, this really is going to help with hydrating your skin. I like to use this stuff during the winter because my skin is so dry. But this will also help clearing up your skin! The next cleanser that I absolutely love is Purity One-Step Facial Cleanser, this is really a great cleanser. Its a 4-1 cleanser, and if your'e okay spending more then I would totally recommend this one. Its going to remove face and eye makeup for you, cleanse your skin, tone your skin, and hydrate your skin! All that in one little face wash! So great! The last cleanser that I would recommend to y'all is St. Ives Apricot Scrub. This is the cleanser that my little sister and boyfriend actually use all the time. I love to use it because I really do think it works so well. If you're looking for something to exfoliate your skin, and help out with blackheads then this is your go to cleanser! I love using this one, because it has the exfoliation and my skin always feels so soft after I wash it. It also really does help with blemishes! I hope y'all give these a try! They really are the best!